We’ve had a lot of authors give insight into their template creation process in these Author Spotlights. But we’ve never had anything as in-depth as what you’re about to read. 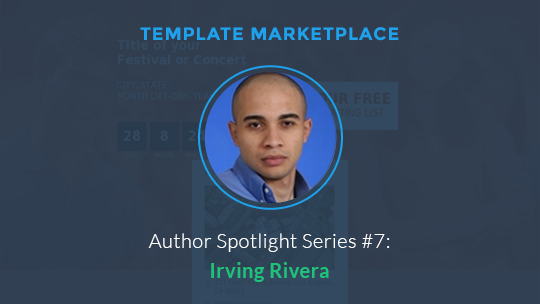 This week, we sat down with template author Irving Rivera (click here to see a listing of all his templates) — creator of the Conference, Event, Meetup Summit (All-In-One Page), The Step-by-Step System & Course (Long Form Sales Page), and Sweepstakes, Giveaways, Contests (Opt-In & Thank You 2-In-1 Page) — to talk about why you shouldn’t rely on “rented land” to grow your business, what “The Frankenstein Step” is in template creation and a sneak peek into what his newest template will be. Enjoy this new edition of the Author Spotlight! 1) Why did you decide to create a template for the LeadPages Marketplace? I joined the LeadPages Marketplace because I went into the public sector right out of college, missing the opportunity to showcase my engineering skills and put them into practice. After five years of being out of touch with the private sector, the LeadPages platform is giving me the opportunity to brush up my industrial design and project management skills and get paid for it. However, the main reason I chose this marketplace above all other ecosystems, such as the iTunes App Store or the Amazon Kindle environment, is because every user of the LeadPages platform is a paying customer, not just a consumer looking for the next free app download, with the added benefit of authors receiving 100%-200% sales commissions. See all his templates by clicking here. 2) Why did you create these particular templates? The most frequent advice we get from internet entrepreneurs such as Pat Flynn, John Lee Dumas, and Michael Hyatt is that although social media properties are great and an important part of any online business, we should not rely on “rented land” to build our businesses—we should always own our space and use other networks to supplement, not as the full strategy. Solutions like WordPress, in combination with tools like LeadPages, help us avoid traps like Facebook’s organic reach because they let us build and own our very own websites. I created the Conference Event Meetup (All-In-One Page) template because I noticed Clay and his team had mastered the art of creating the opt-in webinar page. So I asked myself, if the online event market is already taken, what about the in-person live event market? And voila! 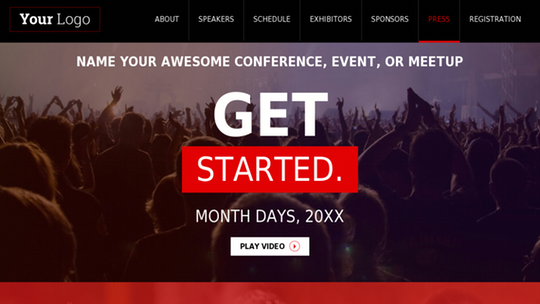 To help online marketers develop their very own properties and decrease their dependence on foreign land solutions like meetup.com, I decided to create the “Conference Event Meetup (All-In-One Page)” Template. Click here to view the entire template. The reason behind the longest and most interactive long form sale page currently in the Marketplace (The Step-by-Step System & Course) is that… only buyers read long form sales pages, which brings conversion rates through the roof! Finally, the task and purpose of the sweepstakes template is to empower bootstrap entrepreneurs who are looking for the opportunity to run list build events like giveaways and webinars without having to break the bank; spending hundreds of dollars on complicate and expensive software solutions. 3) How did you create your templates? Did you collaborate with any designers or coders? When creating these templates, I was more concerned about the process than the end result. These LeadPages needed to take its users through a transformation, starting with getting them excited about the events and leading all the way up to the no-brainer decision of taking action. I collaborated with the awesome team led by Antonio Rillera at LeadPagesNinjas and we followed a three-phase approach to developing the template. Phase I: The Frankenstein Step. In this first step, I described the hero’s journey and storyboarded the user experience. I did this slide by slide, giving a detailed description of the design requirements for the page using bits, pieces, and parts from the World Wide Web. Phase II: Deciphering the Da Vinci Code. Here, the shinobis at leadpageninjas.com transformed my Frankenstein’s monster into a Photoshop file (PSD). With the help of tools such as the InVision app and Skitch, which ensured the integrity of the design. Phase III: Developing the Reality Distortion Field (DRDF). In this step, engineers, designers, and developers worked together to create a unique experience and user transformation. From the outset of this project, I did not want to create just another HTML file for the LeadPages ecosystem; I wanted to create a web app for the Marketplace that included features that have never before been seen on the platform, such as video overlay playback, Google Maps and Eventbrite embed sections, and images that can trigger video playback. This is now the signature move all of my templates. 4) What are some ways marketers can use your template(s)? Any special features first-time users should be sure to take advantage of? 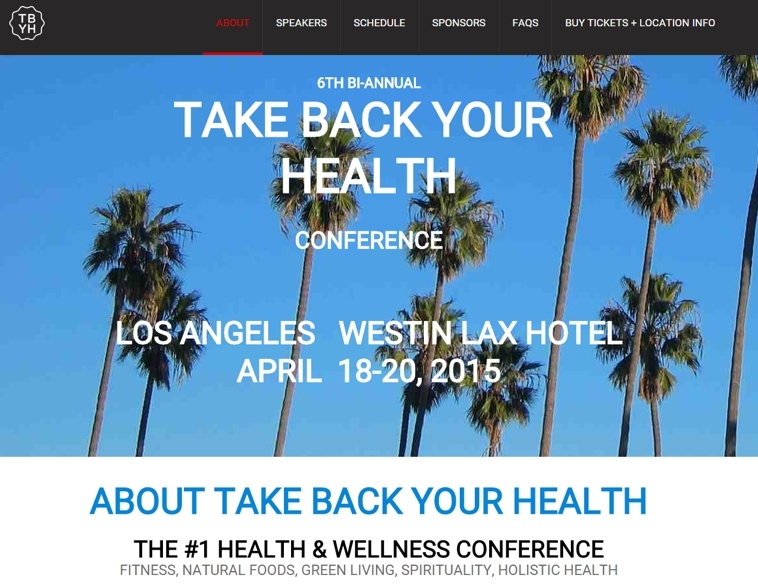 This event/conference template has a single purpose; it does only one thing. During the event season, it sells tickets; during the offseason, it presells tickets with multiple options, such as email collection. As far as the template’s special features go, the publishers of this page are in the driver’s seat. They can have the speakers give a video testimonial about the event because their photos can trigger video playback. They have the resources to create a variety of options from one-day to three-day events and one-ticket to four-ticket packages to options. From one to twenty sponsors and exhibitors; they also have the ability to share the mobile apps they created for their conferences. 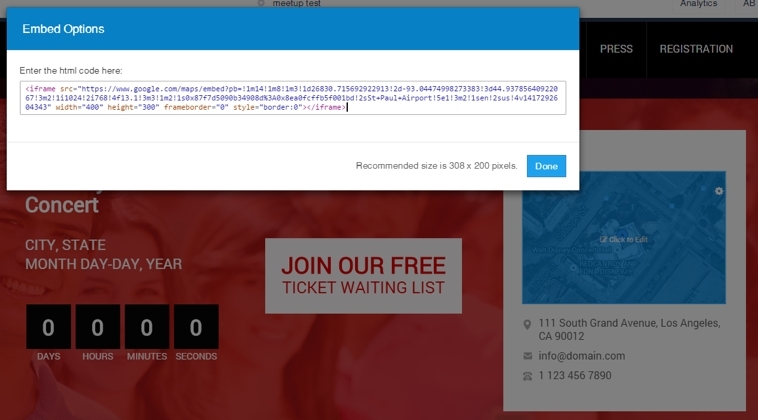 However, the most important feature is the ability to sell tickets within the page with the Eventbrite embed code section. 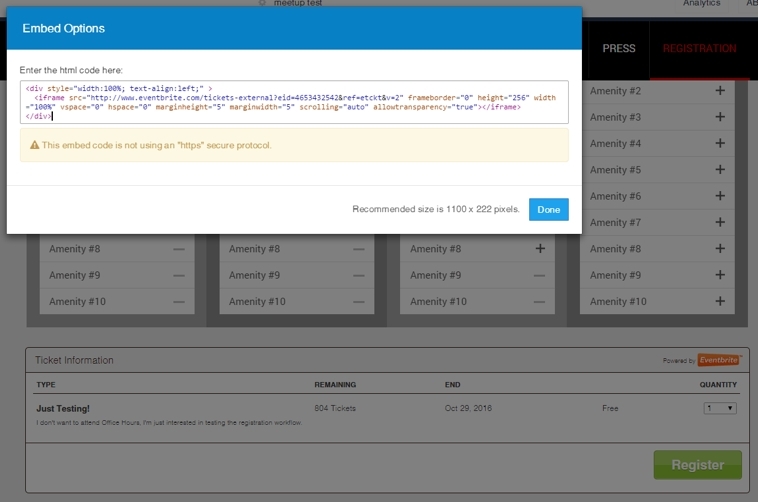 5) Have you seen any cool uses of your template out in the wild? If so, please provide links. See the entire example page here. 6) What are the best pieces of advice you could give to someone thinking about creating a template? Do it—and do something new; push the design boundaries. Do not just make another webinar registration or iPhone App MVP page. Build something that you’re going to be proud of ten years from now because the #LPMarketplace is here to stay. Finally, but most important, build something for you. Build a template you will use yourself for your own business; there is nothing better than scratching your own itch because I bet you will find another LeadPages customer with the same need. 7) What’s one kind of template you’re dying to see added to the Marketplace? Spoiler Alert: My next LP template is all about that funnel (from opt-in to the final sale). 8) Are there any marketers out there you would absolutely love to see create a Marketplace template? Anyway, I would kill to have Ramit Sethi publish one of his legendary course sales pages in the Marketplace. As an official student of his Dream Job and Zero to Launch courses, I know how incredibly good his sales copy and page layouts are every time he releases a new product. I know every LeadPages customer would love one of his templates, just like we all love the ones from Jeff Walker. 9) Do you have any other Marketplace template ideas in the works? Many, but the one I am the most proud of is the Step-by-Step System & Course (Long Form Sales Page). I invite all you guys to check it out. This one was inspired by David Siteman Garland and Create Awesome Online Courses, based on the idea that step-by-step “mechanism” online courses are the hottest info products on the market right now. 10) Are you using LeadPages in your business right now? If so, how are you using it? Yes, but I confess my favorite feature of LeadPages is LeadBoxes. I personally use more than six of them on my personal finance blog, arbitrageportfolio.com. In my other LeadPages templates, I’m also experimenting with something I’d like to share with the community: the idea and customer validation exercise I am doing during Startup Weekend events. In this particular use case, time is of the essence, because we only have fifty-four hours to do customer validation and launch a Minimum Viable Product (MVP). To track customer validation on such a tight timeline, I launch an opt-in page using LeadPages and then driving traffic to it; I use the analytics feature of LeadPages to track the number of visitors who are really interested in the solution we are offering by counting the number of opt-ins we get. In fact, this strategy is working so well for me that thanks to a screenshot from my LeadPages dashboard, our team won Startup Weekend Fort Worth, TX 2014. If you want to see more templates like these, be sure to visit the entire LeadPages™ Marketplace for some of the best landing pages templates you’ll ever see. Check back on the blog every Wednesday for more posts from the Marketplace, as we’ll be featuring more interviews, templates and a few other surprises.